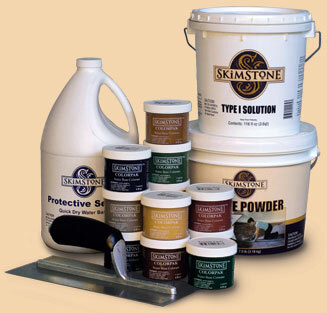 SkimStone Type I Solution is a proprietary blend of acrylic resins formulated to bond with the SkimStone Powder to create Hybridized Portland Cement. The Type I Solution serves as the tint base for color mixing. The water base formula promotes easy clean up. Available in 1 and 5 gallon pails. SkimStone Powder is a proprietary mixture of ingredients developed specifically for use with SkimStone Type I Solution to create Hybridized Portland Cement. This extraordinary product provides exceptional adhesion to most surfaces with incredible flexibility, durability and versatility of design. Available in 7 and 30 lb pails. SkimStone ColorPaks come in 17 exciting ready-to-use colors. Each color can be used in different strengths to create an endless variety. For a rich, dark color use up to 2 ColorPaks (8 oz) per gallon of Type I Solution. Or, use a partial ColorPak to create a beautiful pastel shade. ColorPaks can also be intermixed to formulate original one-of-a-kind colors. SkimStone Protective Sealer is a water base urethane coating that brings out the distinctive color and texture of SkimStone and adds a beautiful sheen. A minimum of two coats is recommended for providing extra protection and durability to your SkimStone surface. If a higher gloss is desired, up to four coats may be used. Available in quart or gallon containers. SkimStone Bonding Primer is for use on non-porous substrates. It provides inter-coat adhesion plus a textured surface to promote high-adhesion with the SkimStone topcoat. This product was developed for use on plastic laminate (Formica®) countertops. However, it is also appropriate to use the Bonding Primer on concrete floors where surface prep is needed but where it is impossible to use diamond grinders or shot blasting equipment. CAUTION: this is not meant to replace mechanical prep in any other situation! Available in 1 and 5 gallon containers. SkimStone Cleaner is a mild, safe solution that will help maintain a beautiful, clean floor. Just spray directly on the floor and wipe immediately with a clean cloth. The neutral pH and special biodegradable formula is perfect for cleaning other hard surfaces too. SkimStone Select Finish is a two-component waterborne finish designed especially for commercial applications. Select Finish must be applied over 3 coats of SkimStone Protective Sealer. Select Finish is available in Gloss, Semi-Gloss and Satin.